What wonderful blend of savory and spicy will we bring this year? 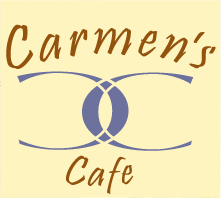 You’ll have to come and see! It’s all good, all for the homeless, AND you walk home with a handmade bowl, courtesy of area potters and volunteers. A unique event to support the growing fight against the issue of hunger. Description: The Empty Bowls Program is a wonderful grassroots movement that have brought artists, chefs, and communities together to help raise money for local food programs. 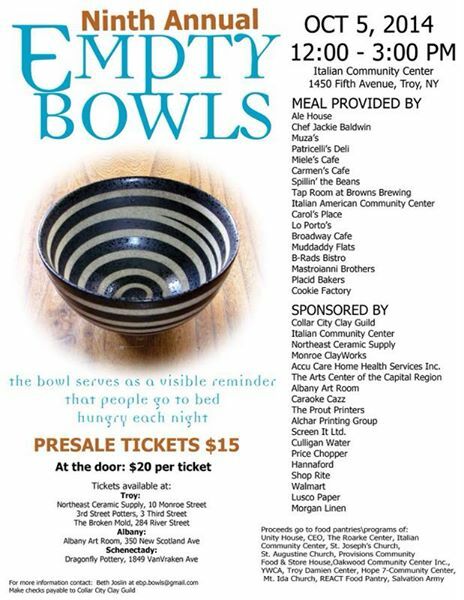 Started nearly 20 years ago, it spread throughout the country to raise money and awareness about hunger.For the past seven years, the Collar City Clay Guild, in partnership with the Troy Architectural Project, Inc., has been fortunate to organize the Empty Bowls Project in Troy, NY. The Empty Bowls Program has become a community event in the city that draws hundreds and maybe even over a thousand people each year to help raise money for food programs.Every year, the Troy community flocks to the Italian Community Center with the great expectation of warm soup, fresh bread, beautiful handmade bowls, and the wonderful company of friends. By selling bowls, we have been able to raise almost $100,000 for the food programs in Troy.Since the beginning of the Empty Bowls Project in Troy our impact has been great, in 2009 we supported 17 food programs in Troy to help put food on their shelves and deliver food to those in need. This entry was posted in News, Special Events and tagged Collar City Clay Guild, food programs, Inc., Italian Community Center, NY, Troy, Troy Architectural Project. Bookmark the permalink.